Prosser�s Beach Volleyball story started in 1990 as the Australian played in the 10th-most FIVB events entering the 2008. A three-time Olympian Prosser was 17 when he began playing internationally in 1990 with Andy Burdin. Prosser, a fourth-place finisher at the Athens 2004 Olympic Games with Mark Williams, is Australia�s top men�s performer internationally. Concluding his 17-season FIVB career in 2006, Prosser also competed in the Atlanta 1996 and Sydney 2000 Olympic Games with Lee Zahner. Entering the 2008 international Beach Volleyball season, Prosser is 23rd on the career earnings list ($372,003). Prosser and Zahner rank 20th all-time in FIVB earnings ($487,200) for 87 events with a 2001 gold medal in Berlin along with five bronze medals and nine �final four� finishes together. One of 14 players to play in all three Olympic Beach Volleyball competitions, Prosser placed ninth in both 1996 and 2000 with Zahner. At the Athens 2004 Olympic Games, Prosser and Williams lost twice to <?xml:namespace prefix = st1 ns = "urn:schemas-microsoft-com:office:smarttags" />Switzerland�s Patrick Heuscher and Stefan Kobel, including a 19-21, 21-17 and 15-13 bronze medal decision. Prosser and Williams also lost to Javier Bosma and Pablo Herrera of Spain, the Athens silver medalists, 21-18 and 21-18 in the Olympic semi-finals. Prosser�s first contact with Volleyball was at high school in 1985. 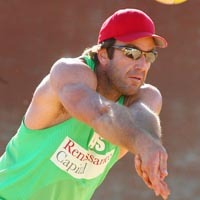 In 1988, he was introduced to the Beach Volleyball on the sands of Cottesloe Beach in Perth. He then went on to win his first of 12 national titles in 1990 at the age of 17 on Glenelg Beach in Adelaide. Prosser has a bachelor of commerce degree in economics and financial management from Curtin University in Perth. His hobbies are surfing, hanging with the family and old Fords.